I like bacon. I got a chance to try out Hormel's Natural Choice Original Uncured Bacon with a free sample through MyMagazine Sharing Network recently. I think this will be my go-to bacon from now on. I like the flavor and the fact it is uncured and doesn't have the nitrites in it like cured bacon is important to me. My favorite way to prepare bacon now is on a cookie sheet in the oven. I cover the cookie sheet with foil and place the bacon close together and fit as many as I can on one sheet. (Usually around 10 pieces). I put it into a cold oven and set the temperature to 450 degrees. I immediately set a timer for 20 minutes and check the status at the end of the timer. Usually it only takes a few minutes more to get to the degree of doneness I like. I then use tongs to place the hot bacon on paper towels to absorb the excess bacon fat. It is easy to pour off the bacon fat from the cookie sheet into a container after it cools a bit, but while it is still liquid, and save it for other recipes calling for bacon fat. A bonus is that you can fold up the corners of the foil and wad it up and throw it away (or recycle) and the cookie sheet is still pristine! 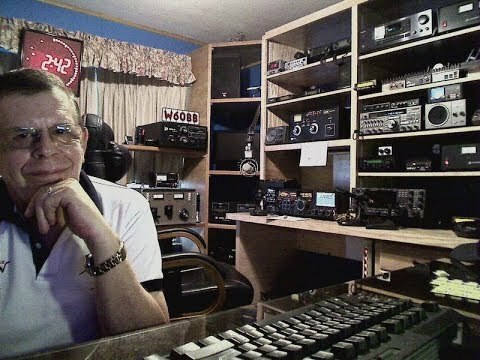 It's been a while since Art Bell did his own show, but he was still a part of my life until his recent departure from this planet on Friday, April 13, 2018. We were Facebook friends since 2011 and I kept up with his new family that was still growing and responded to his comments, which were very much like my own thoughts. Art was a definite influence on my life. I was always the curious type and loved to listen to late night radio ever since I was a kid. That's how I discovered Art. I instantly became a fan once I found out he was an amateur radio operator, a topic that came up often on his show. It was during the 1990's before there were iPods and Podcasts, so in order to work during the daylight hours that my job required from me, I had to get creative in my thinking on how to listen to his entire show and still get a nights sleep. Having a Pioneer component stereo system that included an auto-reverse cassette tape deck, I acquired the best quality metal tapes in the C-120 size which gave me 2 hours of recording time and set my alarm on my clock radio for 12:05 AM so I could get up and start the recording and again at 2:05, when I put a second tape in the deck for the rest of the show to record. I then took a portable cassette player with me in my work van and listened to the recordings as I made my commute and during the day between stops. It wasn't perfect, but it worked for me. Art introduced me to several authors that piqued my interest in curious things as well. If it weren't for Art, I would never heard of Graham Hancock, author of "Fingerprints of the Gods", Colonel Philip J Corso, who wrote "The Day After Roswell". Also there was Zecharia Sitchin who had his own interpretations of Sumerian clay tablets, Linda Moulton Howe, who investigated crop circles and more with vigor and Patrick "Paddy" Heron, author of "Nephilim and the Pyramid of the Apocalypse" who became a personal friend of mine after I contacted him about his book, may he rest in peace. Art also introduced me to music that I may never have thought to seek out with his amazing bumper music repertoire. In the New Age category, I fell in love with Cusco and Loreena McKennitt. Also, expanding my taste, I learned to enjoy Crystal Gayle, The Highwaymen and Tito & Tarantula. Because of his love for music, I became a music lover... so much so that I can't stop making classic music ringtones for my phone these days. Art's ham radio discussions on the air on his show and on HF were something I enjoyed the most. I never had a QSO with him, but I heard him on 160 meters often and enjoyed hearing about his huge 75 foot high two wire loop antenna that generated 350 volts on its own from the atmosphere until he figured out how to tame it. How I would love to have a 5 acre antenna farm like his. Even though I already had a license before listening to Art, his participation in the hobby encouraged me to upgrade my license. Rest in peace, Art. Thanks for all the hours of entertainment and being a part of my life. Well, a legend has passed. My uncle Al Schade, amateur radio operator N6UMW passed away at 93 in his sleep last night. He was an inspiration to me all throughout my life. He was in WWII and the Korean conflict and migrated into the Space Program and became an integral part of it during the Apollo years and ushered in the Shuttle. His last role was Project Engineer for the Shuttle Challenger. He retired after that and said it was amazing they even got those things working. "They literally have over a million moving parts!" he said to me once. One of the coolest things Uncle Al did for me was spark my interest in science. He gave me a window from an Apollo spacecraft command module (one that was extra and never went into space) and a couple of test tiles for the space shuttle heat shield. Uncle Al was also very diligent about sharing family news with his blind (from diabetes) brother Walter in the 1960's and even sent him miniature reel-to-reel tapes with "letters" on them. I found one when I was younger and have digitized it below. It talks about the family for a bit and then there's a complete play-by-play narration on how an Apollo mission will be conducted, strewn with extra facts only an engineer would appreciate. Give it a listen, it's fascinating! I remember when I first got interested in ham radio... it was years before I actually got my license. Uncle Al always had an interest in it too. We both got our licenses in the late 1980's and we once had a QSO on 10 meters. We were both excited to be able to hear each other. I was in Houston, TX and he was in Cambria, CA. Alas, that was the only time we were able to talk on the air. I always knew the day would come when Uncle Al would pass. He was almost 94 years young. I'm just happy he passed in his sleep and it was peaceful in the end. I have mixed emotions about his loss. Mostly I'm happy that he lived a life to celebrate and not so sad. After all, he's been reunited in heaven now with his siblings that have already gone and his parents and I'm sure it's a joyful occasion. On Friday, February 24, I realized that the website for Amateur Radio Newsline was about to expire. It's been hosted on Squarespace for the past few years but using their version 5 software, which had some limitations. My website has been on version 7 for awhile, so I was encouraging my fellow volunteers for the Newsline site to migrate while we had the chance. Well, we did it! It was made easier by the implementing the built-in import tool that Squarespace provided, but there was a lot of tweaking to get it back to contain every feature it had in Squarespace 5. Namely, I had to select a different theme for the new site that had a sidebar option. That's not readily apparent when you look at the demo sites using various templates. With a little help from googling for the feature, I was able to find the right template. Lots of tweaking was required to get the font size and elements that we wanted to upgrade. We were able to add a page displaying a list of repeaters that regularly rebroadcast the Amateur Radio Newsline reports each week, for example. We also were able to provide a better experience when looking at the Staff pages. With the additional updates we made, we discovered several people that are regular contributors to the site aren't currently represented on the Staff pages. We're working on gathering their biographies and headshots right now so we can get them added. One negative outcome from the migration was for those who use automated software to auto-download the weekly file for their repeater. That link changed and there was no way to keep it the same, unfortunately. I have been fielding questions from the amateur radio community since Saturday (when the switch occurred) on how to re-link to that weekly file. The new permanent address is: http://arnewsline7.squarespace.com/s/news.mp3 This file will be updated weekly for each new report but the filename should stay the same. Sorry for the inconvenience. Hopefully you'll discover this post and be able to update your system with the change and prevent any problems when people at your repeater site play the report. Hopefully we'll be able to provide more information and better service the amateur radio listeners out there with our steady improvements. Let me know if you have any ideas on additional elements to add or if you see something that needs to be updated on the site. Be sure to check out the new site for Amateur Radio Newsline and subscribe to the podcast if you don't already. I'm excited. I didn't expect this, but I jokingly said to my wife when I showed her a photo a friend posted on Facebook that September was "Buy Your Husband a Radio Month" and that she should buy me my dream radio. Imagine my surprise when she said "Go buy your dream radio, Honey!" Well, that was quite unexpected! I realize that there might be many better radios out there than what I chose as my "Dream Radio", but I had to keep it realistic, so I opted for an IC-7300 by ICOM. I currently own an IC-7200, which is a great radio, but the new IC-7300 is the latest technology and SDR based, so there's a lot of room for upgrading with (hopefully) new features as time goes by since it is software defined. Also, it was a reasonable price. ICOM calls it an "entry level" radio, but I think it's an order of magnitude better than what used to be considered an "entry level" radio. The unexpected upgrade didn't come without strings, however. I had to agree to recover as much as I could with the sale of the old radio. I thought that was reasonable, so I am prepping the old 7200 for resale. Glad I saved the box! What I haven't decided yet is whether to sell locally through a Yahoo Group of local hams or through eBay. I might do the local group just to help someone locally get what they're looking for and save on shipping hassles.